Colin Kaepernick in GQ’s December 2017 issue. “Celebrating the man who became a movement,” noted GQ in its announcement this morning (Nov. 18) that former NFL quarterback Colin Kaepernick has received its coveted 2017 “Citizen of the Year” honor. The magazine on Monday released the covers of its four “new American heroes,” including late night host Stephen Colbert, NBA star Kevin Durant and “Wonder Woman” star Gal Gadot in addition to Kaepernick. Rapper J. Cole, director Ava DuVernay and actor/activist Harry Belafonte were part of a 10-person team of contributors to Kaepernick’s piece, offering “rare insight” into the athlete through their own perspectives of activism, protest, and equality. 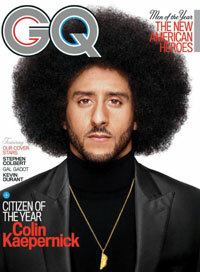 Though Colin Kaepernick continues his silent protest, he agreed to collaborate with GQ on a special project for our December Men of the Year issue in an effort to, as the piece ex-plains, “reclaim the narrative of his protest.” He helped us assemble a 10-person team of his closest confidants—including rapper J. Cole, director Ava Du-Vernay, activist Harry Belafonte, and Women’s March co-organizer Linda Sarsour—to speak on the subjects of activism, protest, and equality, and to offer some rare insights into Colin Kaepernick himself.